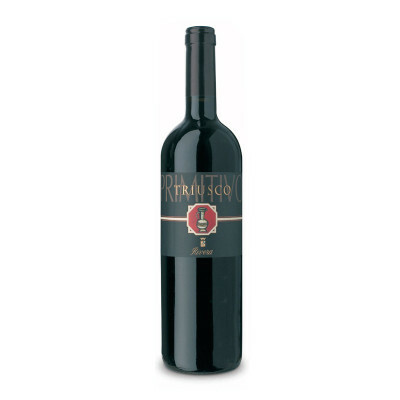 An opaque purple; intense bouquet of blackcurrant and blackberry; very full-bodied, warm, and smooth in the mouth, with fragrant notes of dried plum, cassis, and dark chocolate. Triusco is a balance between the characteristics of the primitivo variety grown in two different terroirs: 60% comes from Manduria and 40% is sourced from Gioia del Colle DOC area. 1Primitivo 100%. IT MAY CONTAIN SULPHITES. Abv 14%. It is ideal with beef and venison.